The country is bracing for what looks like a long and brutal winter season. As another Polar Vortex descends from Canada, people are flocking to the stores to stock up on snow shovels, ice melt and pocket warmers. But in the face of an icy villain these items are a paltry defense. Caitlyn Snow, the S.T.A.R. Labs arctic circle research assistant goes mad after her colleagues betray her. 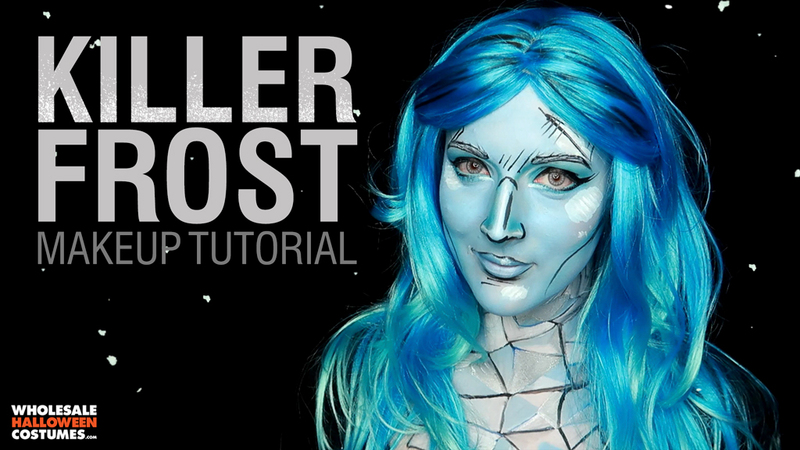 She becomes a primal fighter encased in permafrost after she attempts to damage her research equipment in an act of revenge, thus becoming Killer Frost. Her insatiable hunger for heat leads her down frozen path of destruction and death in her attempt to acquire and absorb all warmth. Using her power to drain her opponents of all heat with a touch, or generating spikes of ice to spear anyone who tries to stop her. So go ahead, and load the backup generator up with fuel, because as long as Killer Frost is hanging around, the forecast is calling for ongoing cold and icy precipitation. At least until Firestorm can raise the temperature and figure out a cure to this frosty affliction. Our friend Caitlyn Kreklewich created this crystalline pop art version of this cold hearted character. Follow along with the video or check out the step by step below. 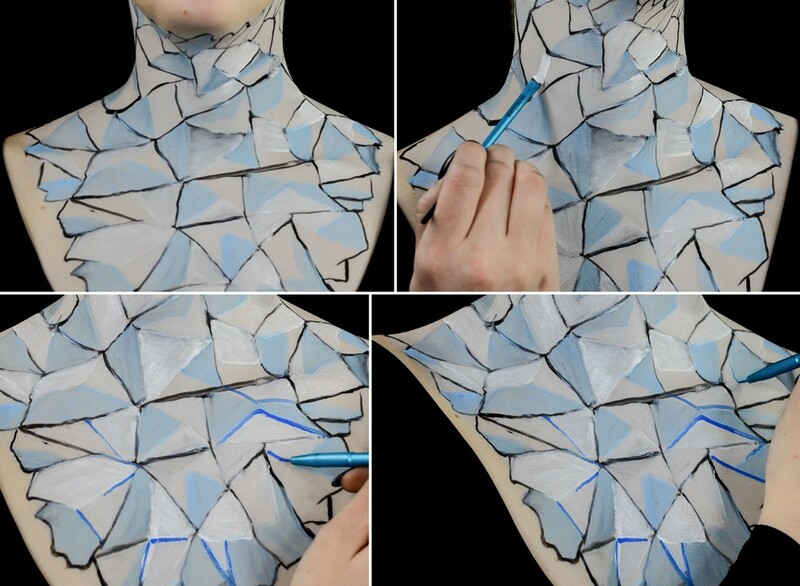 Outline angular shapes all over your chest and neck with black and fill in with white and light blue makeup. Add selective blue and sliver lines along the edges of some of the shapes you have created. 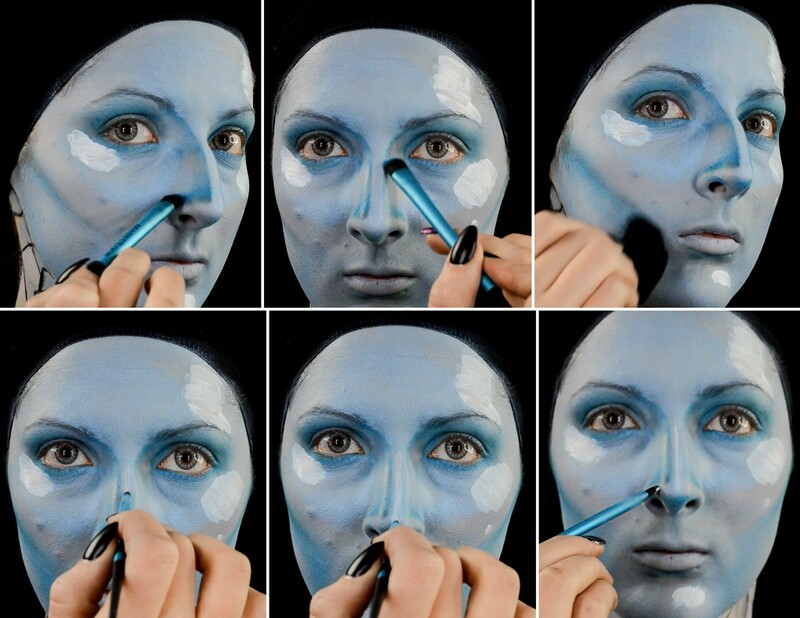 Cover your entire face in light blue makeup. 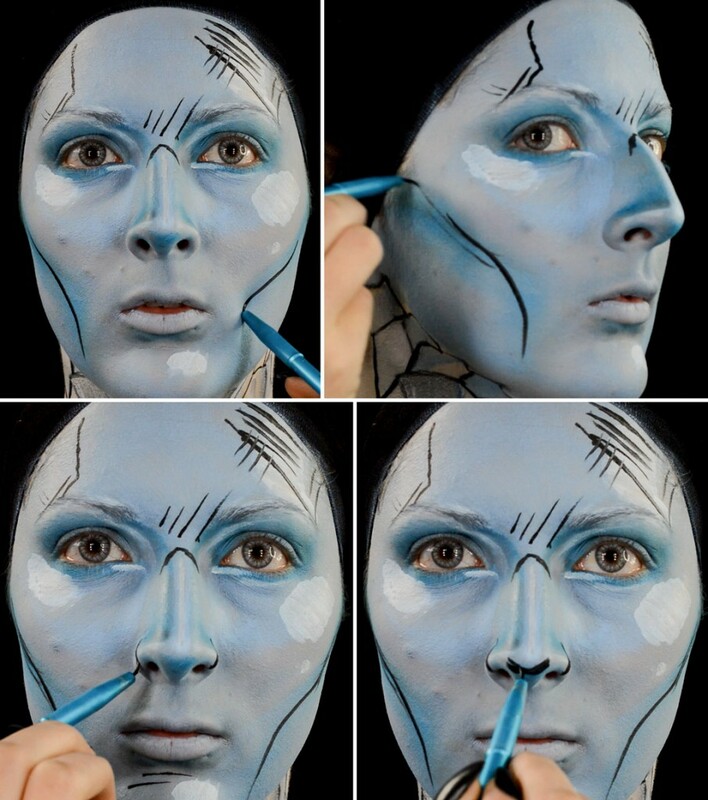 Add an extra coat of brighter blue makeup over the upper cheek. 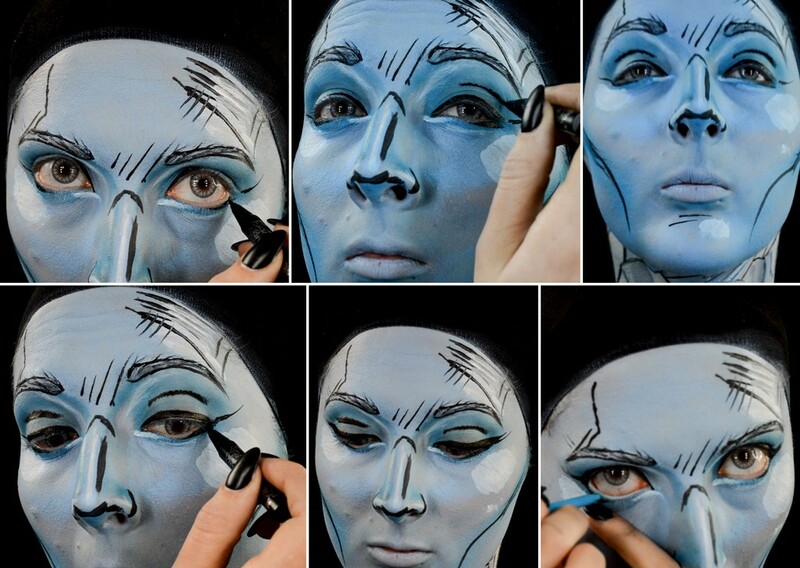 Using a blue eyeshadow, draw contour lines along the bridge of the nose and along the nostrils to define the shape. Use the same blue eyeshadow over each eyelid, blending up to the brow. Add highlights around the face with white makeup- on the side of the forehead, under the eye, off centered on the chin, and along the cheek bone, as shown. 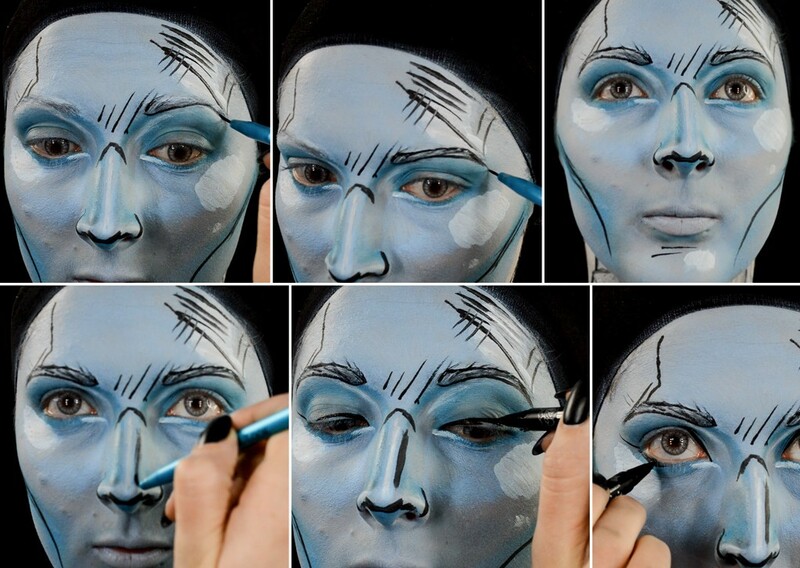 Add more contour and shadow with the blue eyeshadow along the side of the nose. 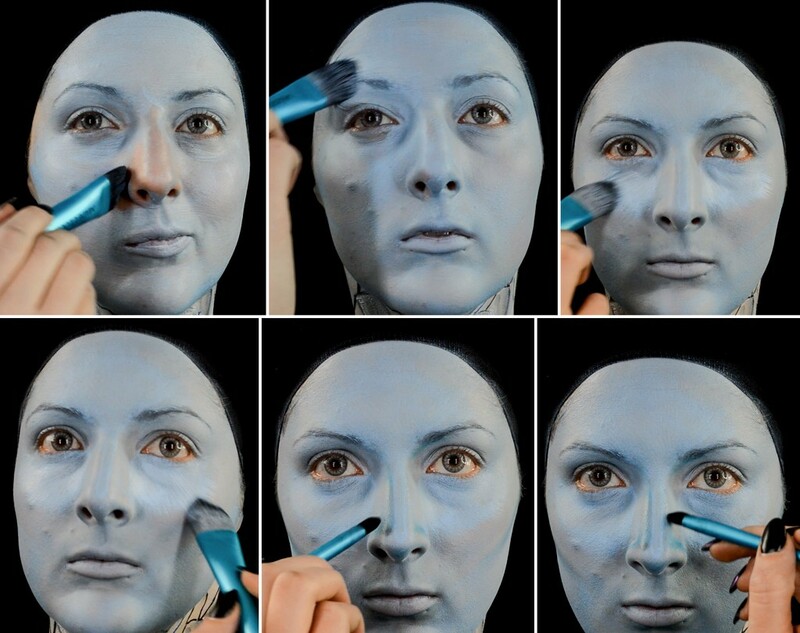 Sweep blue shadow with a fluffy brush under the cheek bones and down to the chin to really add sculpting to the face. With silver or white makeup lay a thin highlight line down along the bridge of the nose and at the tip. Continue the highlight line along the nostrils. Add a small highlight just under the inner corners of the eye and on the inner upper lids under the brows. Paint your eyebrows white white with short messy strokes. To finish the pop art look use a thin brush to add black lines and cross hatching. Outline the temple on one side of the face and lay down cross hatching on the other temple. Add and upside down U between the eyes and short slanted lines between the brows. Define the cheeks with lines from the ears, under the cheekbones and down to the jawline. Add few lines across the shadow under your lip. Paint on parenthesis-like lines on either nostril and a wide U to define the tip of the nose. Outline each eyebrow with black lines and fill in with short black hatch marks. Drop a thin black line down along one side of the nose. Start lining the upper lid with a bold double winged line. Also line the outer edge of the lower lid. Define the cut crease with a black line. Tidy up and connect the liner on the upper and lower lid. 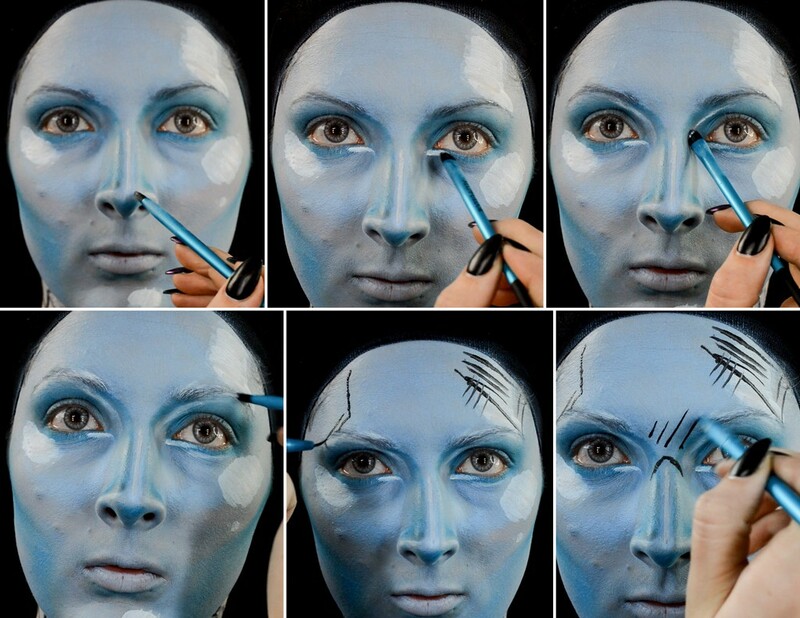 Use a bright blue or white liner on the lower water line. Apply a blue lipstick then paint on white highlights on the upper and lower lip, and one spot at the corner of the mouth as shown. Outline the lips with a clean, thin black line. 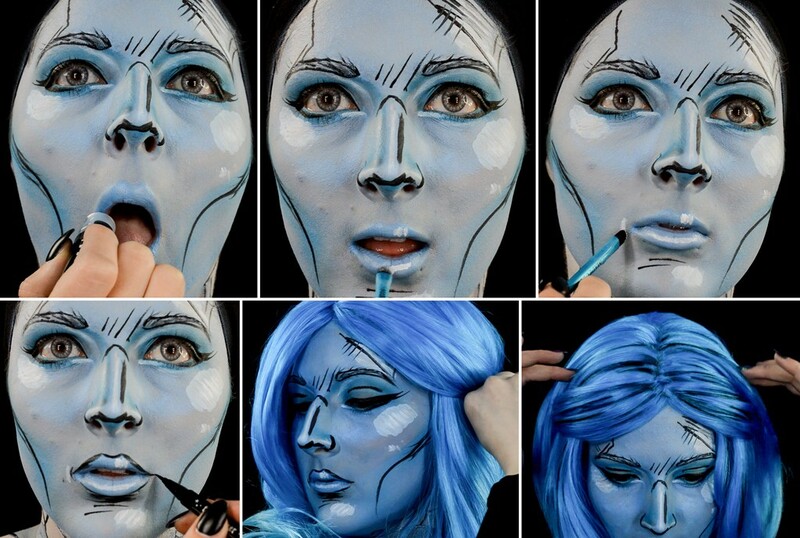 Finish the look with a flowing blue wig. Add streaks of black makeup to stay consistant with the pop art look. 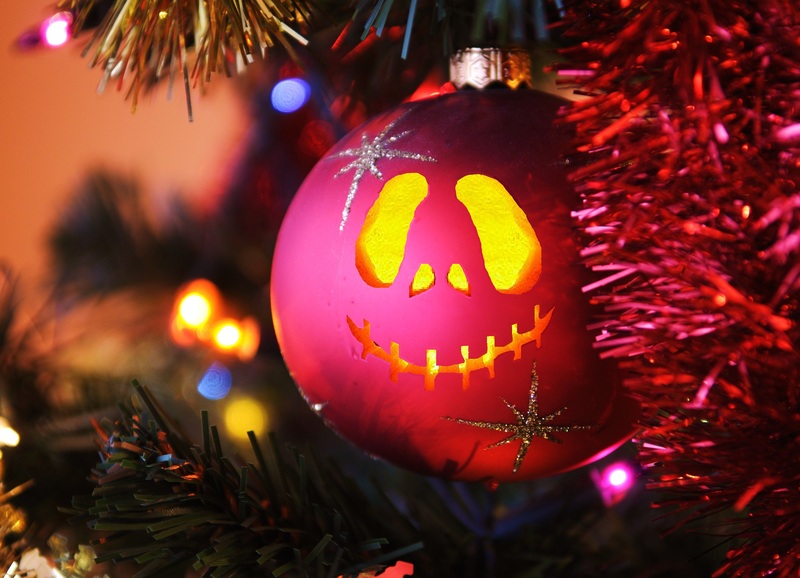 This look is sure to send shivers down the spines of your enemies! 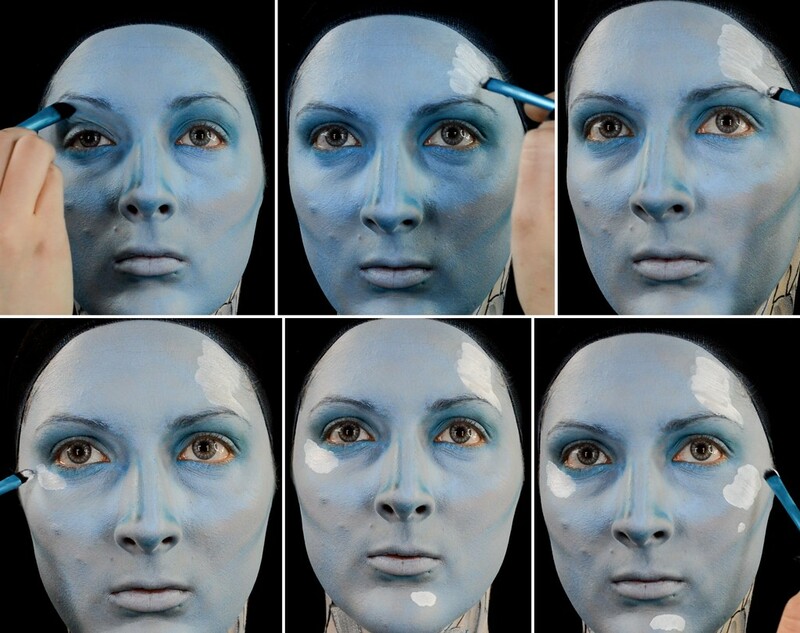 Show us pics of your version of this makeup look our Facebook, Twitter or Instagram using #WHCdoesSFX!